Bored? Try Doodling To Keep The Brain On Task "Yes, I am paying attention" Everyone from presidents to rock stars to students has at some point doodled when the mind wanders. A new study says doodles can actually help the brain avoid distraction. What did past U.S. presidents doodle in their margins? 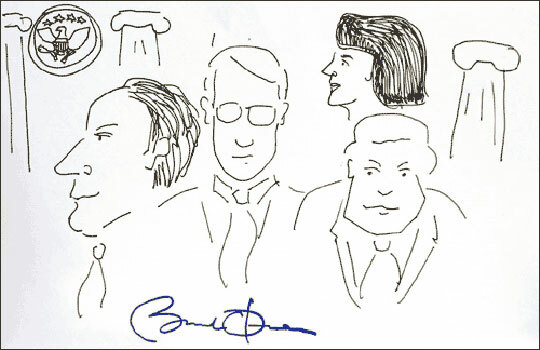 President Obama's doodle, sketched as part of a "National Doodle Day" to benefit the charity Neurofibromatosis, contains likenesses of Senate Majority Leader Harry Reid (D-NV) and Democratic colleagues Edward Kennedy of Massachusetts, Dianne Feinstein of California and Charles Schumer of New York. Four years ago at Davos, the famous world economic forum, then-Prime Minister Tony Blair appeared on a panel with Bill Gates, Bill Clinton and the rock star Bono. After the panel, a journalist wandering the stage came across some papers scattered near Blair's seat. The papers were covered in doodles: circles and triangles, boxes and arrows. "Your standard meeting doodles," says David Greenberg, professor of journalism at Rutgers University. So this journalist brought his prize to a graphologist who, after careful study, drew some pretty disturbing conclusions. According to experts quoted in the Independent and The Times, the prime minister was clearly "struggling to maintain control in a confusing world" and "is not rooted." Worse, Blair was apparently, "not a natural leader, but more of a spiritual person, like a vicar." Two other major British newspapers, which had also somehow gotten access to the doodles, came to similar conclusions. The doodles were not made by Blair; they were made by Bill Gates. Gates had left them in the next seat over. Gates is a doodler, and he's not alone. Lyndon Johnson doodled. Ralph Waldo Emerson doodled. Ronald Reagan drew pictures of cowboys, horses and hearts crossed with arrows. Most of us doodle at one point or another. But why? To understand where the compulsion to doodle comes from, the first thing you need to do is look more closely at what happens to the brain when it becomes bored. According to Jackie Andrade, a professor of psychology at the University of Plymouth, though many people assume that the brain is inactive when they're bored, the reverse is actually true. So when the brain lacks sufficient stimulation, it essentially goes on the prowl and scavenges for something to think about. Typically what happens in this situation is that the brain ends up manufacturing its own material. Andrade tested her theory by playing a lengthy and boring tape of a telephone message to a collection of people, only half of whom had been given a doodling task. After the tape ended she quizzed them on what they had retained and found that the doodlers remembered much more than the nondoodlers. "They remembered about 29 percent more information from the tape than the people who were just listening to the tape," Andrade says. In other words, doodling doesn't detract from concentration; it can help by diminishing the need to resort to daydreams. It's a very good strategy for the next time you find yourself stuck on a slow-moving panel with an aging rock star and verbose former president.